Space Wars takes you on an intergalactic adventure with a diplomatic mission to five strange looking alien nations in a remote location of the universe. The house has an edge of only 3.2%, which is quite low. 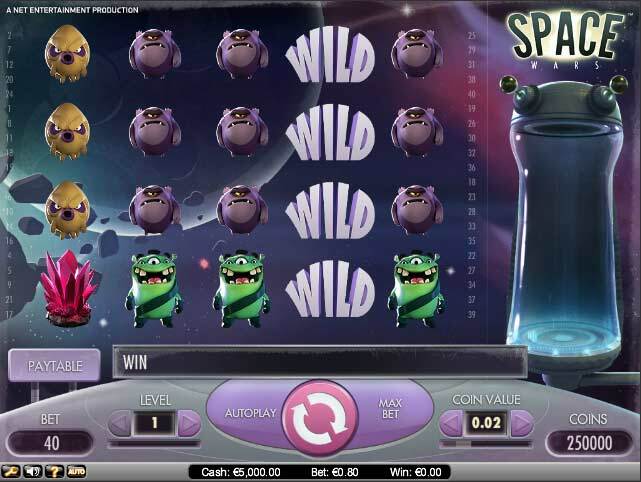 The bet levels and coin values can be adjusted to different levels. You can get Wild symbols on reels 2 and 4 when playing in the normal mode or Cloning Pod Re-spins mode. The Wild symbol can act as any other symbol, enabling winning combinations. And pardon the pun, but as wild as it sounds, all symbols, even the Wild symbols, can stack up on the reels, even during the re-spins. The symbols stack up forming a block that can cover the whole reel, resulting in even more winnings. Any winning combination causes the symbol of the combination to appear in the Cloning Pod. The Cloning Pod will then start a free spin, cloning more of the symbols to the winning lines, resulting in even more winning combinations. There are 40 bet lines and10 bet levels. The coin value can be adjusted from as low as 0.01 to 0.50, so you can get a lot of rolls and winning possibilities, even with a thin wallet. Bet level refers to how many coins are put in on each winning line. The coin value is naturally the value of a single coin, and coin values are 1 cent, 2, 5, 10, 20 and 50 cents. The math is quite simple in terms of calculating the value of the total bet. The smallest possible bet is a coin value €0.01 with 40 winning lines and bet level 1, which equals €0.40. Maximum bet is as much as €200 a round, if you want to try your chances. You can access the possible winning combinations by clicking the pay table button on the bottom left corner of the screen. And remember that you’ll only get a payment for the highest winning combination that appears on the winning line after each round, but winning combinations on different lines will be added up, sometimes amounting to very high prizes. As usual, paylines run from left to the right. It might be difficult to see the combinations you get with the naked eye. But this just means that there will be some pretty happy surprises.